In preparing my December quarter and FY2011 estimates for Apple, I'm looking to the company's FY2010 results for benchmarks and clues concerning revenue growth trends. FY2010 was a year of extraordinary growth for Apple, delivering revenue growth of about 52% and eps growth of roughly 67%. The emergence of the Apple iPad in the revenue mix for the June and September quarters was crucial to Apple's ability to deliver the growth numbers mentioned above. For the fiscal year iPhone unit sales grew about 90%, Mac unit sales grew about 30% and the Apple iPad (device sales and related accessories) represented 7.6% of the company's reported revenue for the fiscal year and contributed about 11.6% of the 52% growth in revenue. This was an extraordinary outcome for a product that was in the market for only six months and for much of that time in constrained supply. Although the Apple iPod line experienced a decline of about 8.5% in unit sales in the fiscal year, revenue grew almost 2.3% due to the sales performance of the iPod touch during the 12-month period. 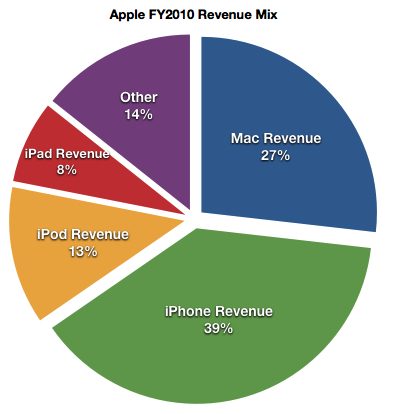 The chart below illustrates Apple's product line revenue mix for the fiscal year. Due to strong growth in iPhone unit sales and an average selling price hovering around $600 per unit, the iPhone and related accessories delivered almost 40% of Apple's revenue in the fiscal year. While much attention is being paid to the Apple iPhone and the Apple iPad, Mac sales contributed 27% of Apple's reported revenue. The continued growth in Mac unit sales (in the September quarter at a rate of almost 2.5x the rate of global growth in PC shipments or 27%) provided a firm foundation for the company's extraordinary revenue and earnings performance. The Apple iPad and related accessories contributed 8% to the company's fiscal year revenue totals. In fiscal year 2011, my early estimates project at least a doubling of the Apple iPad's percentage contribution to overall revenue results. I expect the Apple iPod in FY2011 to deliver no more than 7% to the company's revenue performance. The Apple iPod touch is the singular device in the iPod line that will keep the percentage of revenue contribution from falling further. Last week I posted my early FY2011 estimates and forecasts. Due to the emergence of the Apple iPad, continued strong growth in iPhone unit sales and steady but moderating growth in Mac unit shipments, I expect Apple's revenue growth in FY2011 to surpass the 52% gain experienced in FY2010 and reach as high as 60% for the fiscal year. Due to an expected moderation in gross margins as Apple takes a more aggressive approach to product pricing relative to build costs in an effort to boost unit sales, earnings per share growth may be more inline with the growth in revenue rather than accelerating at a much faster rate. Due in part to one-time adjustments to the tax rates paid in FY2010, earnings-per-share accelerated much more quickly than revenue. Tax rates will have a material impact on the level of FY2011 eps growth. Apple's decision to moderate gross margins to fuel unit sales growth will have a long-term benefit to revenue. Each iOS-based device sold will generate post-purchase revenue through the sales of apps and digital content through iTunes. The pace of growth in iTunes revenue in FY2011 will become much more clear following the release of December quarter results. Nicely written summary Conclusions seem reasonable, if slightly optimistic. The chart is beautiful. I find myself visualizing what it would look like if all iOS devices were combined. They are over 50%, of course. iPod touch seems better grouped that way than with iPods, despite how Apple continues to present the numbers.